I had an early start at Druridge today, followed by a late(ish) visit tonight. We decided to put some nets up today and put them up early as showers and strengthening winds were forecast for afternoon, so I was down on the patch for before 5am. Ringing was slow, which is typical for this time of year. 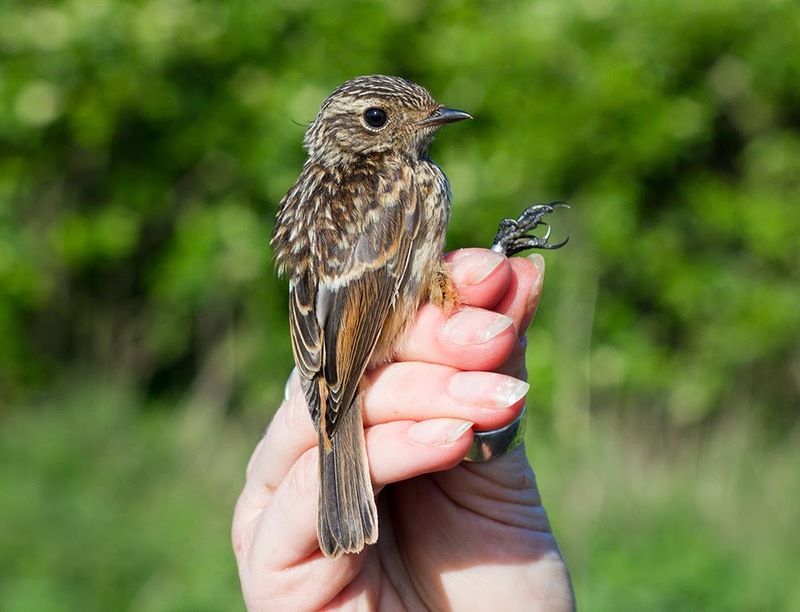 As expected we caught a few recent fledglings, but no warbler juvs yet - chaffinches, robins, dunnocks and to our surprise this stonechat. 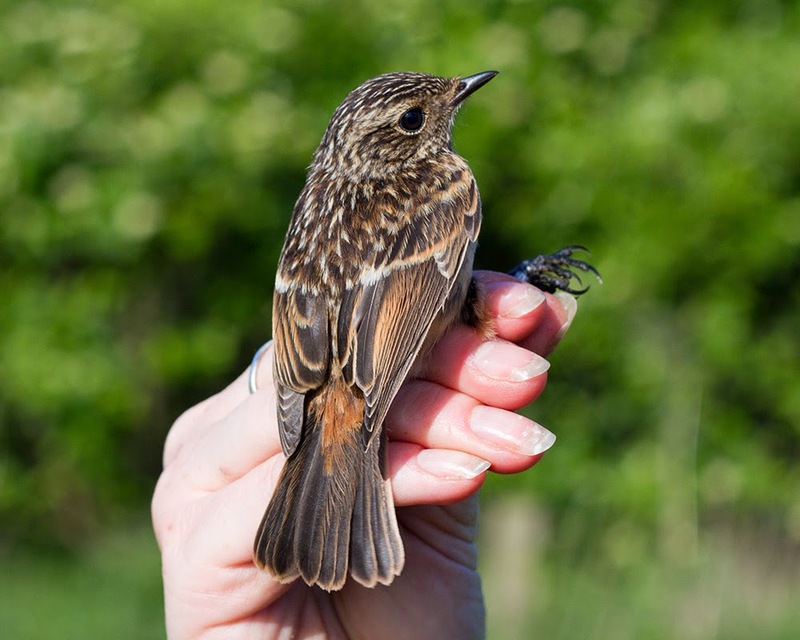 Despite stonechat being a breeding resident, with two to three pairs annually, they tend to stay in the dunes, rarely venturing into the bushes, so we don't get the chance to ring them, other than pullus in the nest. We had some interesting warbler retraps including a willow warbler ringed as an adult last year and a returning sedge warbler ringed as a fledgling last July. I've had to buy a new (to me) camera because my old camera died. I decided to go for a Canon 7D, though I had little time to play around with it today. 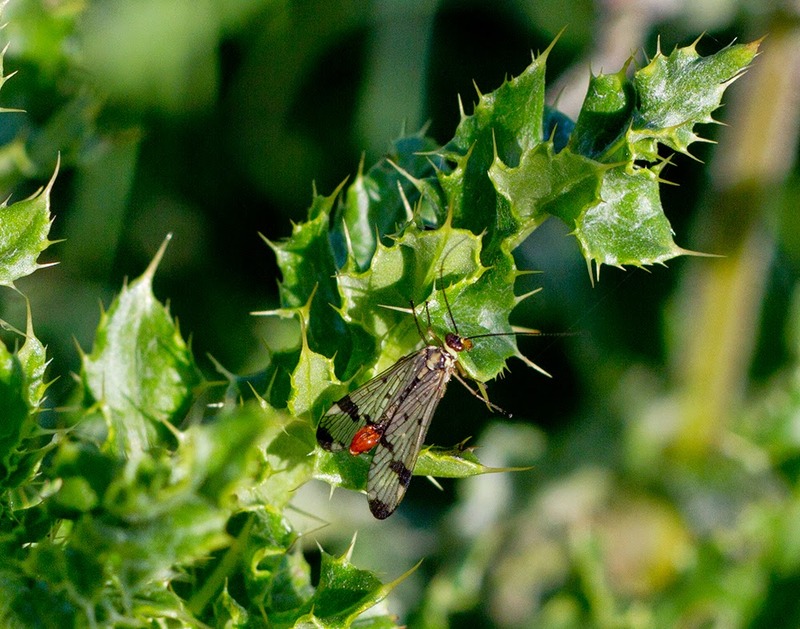 I took this with my 50mm lens, is it a sawfly? This evening I had a quick look on the sea and added a single manx shearwater to the year list. A single red-throated diver in non-breeding garb loitered in the bay and a few fulmars, terns and auks moved back and forth. The rest of the evening was spent scanning from the big dune. Three spoonbills circled and landed behind the rushes, one was an immature bird, I couldn't age the others. Also of note were two little egrets, garganey and hunting barn owls. I got a 7D a few months ago and I really like it. My only minor niggle is that sometimes the images are more noisy than I expected. Scorpion fly , male .